Air Force is one of the most popular having infinite jobs option for its interested candidate. 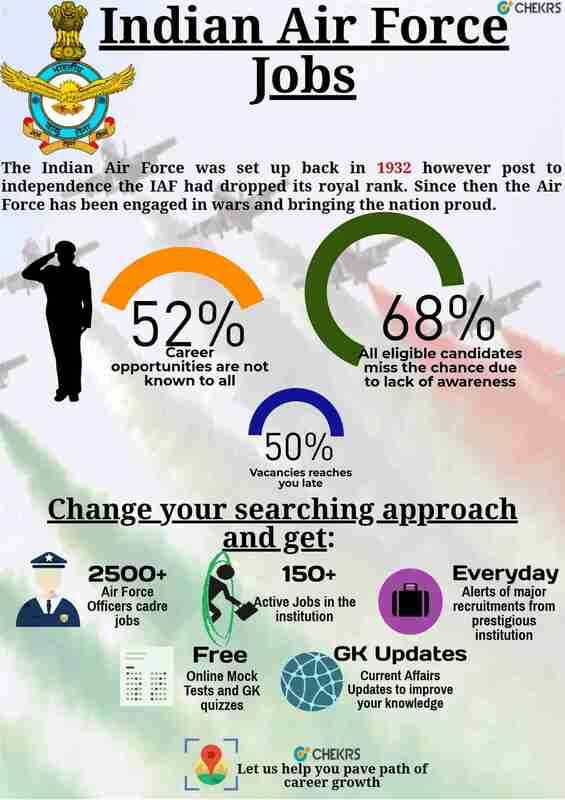 If you are one of them Chekrs is one stop for you to view all Air Force Recruitment 2019 across India. We facilitate you with only best Air Force Sarkari Naukri that can add value in efforts. Air Force is one of the sister branches of the Indian Army. The activities, honors, and awards are given to its servicemen make it more one of the reputed jobs in India. The Air Force Vacancy is for everyone every individual from a different educational background. If you also possess an interest in the field than any of the vacancy from the list of Air Force Jobs for Female, 10+2, Engineers, Graduates, etc. The Latest Air Force Jobs 2019 can be yours through taking the subscription of Chekrs. Why Chekrs for Air Force Latest Vacancy? We don’t end up our services once after informing its readers about the bright chances they have. Rather we strive to provide you all with that complete resource which accompanies to chase the dreams. Here we provide you all extra study material required for Air Force Bharti 2019 that can be helpful in bringing out better results. Through the papers, mock tests and online quizzes for GK, we help you improve your grades.